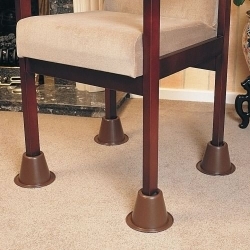 Bed And Chair Raisers - Cone Lightweight And Strong. Bed or Chair raisers - Lightweight but extremely strong moulded cones with a broad base and a recess for the chair or bed leg. Features an anti-slip pad to hold a castor still.